There’s exhilaration every time a public relations firm enters into an agreement with a new engagement. And we’ve written about what agencies need from their client partners in order to be successful. In this post we’re looking at what clients should expect from their PR firm to ensure a productive and long-lived relationship. The chief parameters of the client-agency relationship are covered in the letter of agreement, and planning documents will further outline expectations. Both client and agency will agree on key performance indicators (KPIs) and measurement tools. But there’s also a human side to relationship management. Ask yourself the questions below to see if your agency is focused on the less tangible aspects of the PR partnership. Has the agency maintained staffing as promised? Presumably your account is being serviced by the same competent, experienced team who pitched your business. If changes have occurred, the key players should have have stayed the same, ensuring consistent communication and work. Every agency experiences turnover at times, but frequent staff changes are a red flag. Any concerns should be taken to the top, so that the agency or group head can course-correct before the damage is fatal. Of course, the same applies if a client is seeking to change up team members; clear communication can be the key to a successful swap. Does your firm respect your time? Calling PR a fast-moving field is an understatement, and a key aspect of building a strong relationship is respecting client time. This includes a “cardinal rule” never to ask a client a question that the agency team should know the answer to (or at the very least, where to find it). Basically, your agency partner should never waste your time. We schedule weekly calls that are under thirty minutes with tight agendas, and, with rare exceptions, take place exactly when scheduled each week. You don’t want a partner that is late to the call every week or constantly asks to switch days and times. Stuff happens, but one of the best ways to build and keep trust in a PR partnership is to be consistent and reliable, and that goes for both sides. 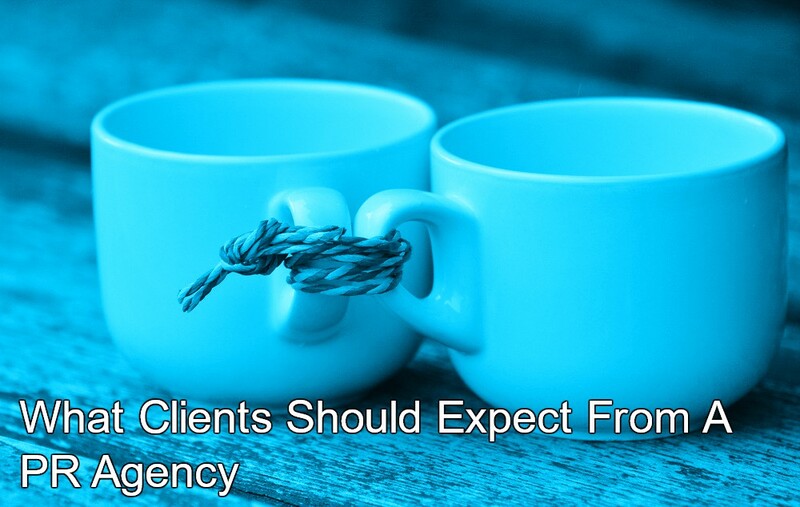 Does your agency partner meet and exceed expectations? Sometimes this means spending extra time vetting an idea or presenting an abundance of research ahead of implementation. It’s part of the basic “client bill of rights” to gain the most thorough understanding of a project’s deliverables, budget, timing and anticipated outcomes before signing off. This is in addition to the obvious agency habits that should be ubiquitous: quick response to any email or call, attending to any weekend or evening work that will move a project forward or mitigate a crisis, and regularly creating and seizing PR opportunities that aren’t in the plan. There are personal touches as well. If a client mentions that he’s dying to try an exclusive new restaurant, or wants a fresh idea for a personal charity, a good agency team will try to make it happen. How keen is your agency’s attention to detail? We may live in a world full of texting errors and sloppy online journalism, but that’s no excuse for a professional PR team to slack off. In a world of social media magnification and news “trust” issues, it’s up to the agency to maintain a high bar and pay meticulous attention to all correspondence and documentation. Some good, basic proofreading tips for both sides of the partnership include setting aside some work and rereading after a break; reading a piece aloud (guarantee you will find something to improve or correct!) or even printing out a hard copy – the difference in format can be valuable to helping you edit. But it all comes down to one thing — attention to detail. Is your agency partner a competent steward of your funds? Is your agency team mindful of travel expenses, bringing only the team members who matter most? Do they offer honest advice on new expenditures like a third-party spokesperson or even a newswire distribution cost? Any recommendation for additional spend should come with a strong rationale and clear calculation of anticipated outcomes. Does your agency function as an extension of your staff? An agency partner should “speak your language,” striving to know your business so thoroughly that it adopts the brand voice in creating content, responding to reporter queries, or crafting a creative presentation for senior management. At a global meeting of our international agency partners, Coca- Cola’s Scott Williamson articulated this well. “I want materials that could have been prepared in house,” is how he put it. And it may seem obvious, but the agency team should be true consumers of their clients’ products and services. There’s no substitute for hands-on experience.